Afghānistān, officially the Islamic Republic of Afghanistan ( Pashto:د افغانستان اسلامي جمهوریت , Persian: جمهوری اسلامی افغانستان ), is a landlocked country at the crossroads of Asia and the Middle East. Generally considered a part of Central Asia, it is sometimes ascribed to a regional bloc in either South Asia or the Middle East, as it has religious, ethno-linguistic, and geographic links with most of its neighbours. It is largely bordered by Pakistan in the south and east, Iran in the west, Turkmenistan, Uzbekistan and Tajikistan in the north, and the People's Republic of China in the far east. The name Afghanistan means "Land of the Afghans". Afghanistan is a mosaic of ethnic groups, and a crossroads between the East and West. It was an ancient focal point of trade and migration. The region of modern Afghanistan has seen many invaders come and go, including the Persians, Greeks, Arabs, Turks, Mongols, British and the Soviets. Afghanistan was created as a nation in 1747 by Ahmad Shah Durrani. In 1919, following the Anglo-Afghan wars, the country gained full independence from the UK over its foreign affairs. Since 1979, Afghanistan has suffered almost continuous conflict, beginning with the Soviet invasion followed by a civil war and finally by the 2001 US invasion, in which the ruling Taliban government was toppled. In December 2001, the United Nations Security Council authorized the creation of an International Security Assistance Force. This force, composed of US and NATO troops, has been involved in assisting the government of President Hamid Karzai in establishing authority across the country. The name Afghānistān literally translates to Land of the Afghans. Its modern usage derives from the word Afghan. The Pashtuns began using the term Afghan as a name for themselves from at least the Islamic period and onwards. According to W. K. Frazier Tyler, M. C. Gillet and several other scholars, "The word Afghan first appears in history in the Hudud-al-Alam in 982 AD." The last part of the name Afghānistān (-istān) originates from the Persian suffix -stān (country or land). From a more limited, ethnological point of view, "Afghān" is the term by which the Persian-speakers of Afghanistan (and the non-Paštō-speaking ethnic groups generally) designate the Paštūn. The equation [of] Afghan [and] Paštūn has been propagated all the more, both in and beyond Afghanistan, because the Paštūn tribal confederation is by far the most important in the country, numerically and politically [...] The term "Afghān" has probably designated the Paštūn since ancient times. Under the form Avagānā, this ethnic group is first mentioned by the Indian astronomer Varāha Mihira in the beginning of the 6th century A.D. in his Brahat-samahita. The term "Afghanistan" was mentioned by Mughal Emperor Babur in his memoirs of AD 1525, referring to the areas south of Kabul which were inhabited by Pashtuns (called "Afghans" by Babur). Later, the English word "Afghanland" that appeared in various treaties in the 19th century, dealing with the Pashtun territories in Kandahar as well as south of Kabul, was translated as "Afghanistan" by Afghan authorities and was extended to the entire kingdom during the reign of Abdur Rahman Khan. It became the official name of the country in 1919, after Afghanistan gained its full independence from the British, and was confirmed as such in 1964 by Afghanistan's first national constitution. Afghānistān has borne that name only since the middle of the 18th century, when the supremacy of the Afghan race ( Pashtuns) became assured: previously various districts bore distinct apellations, but the country was not a definite political unit, and its component parts were not bound together by any identity of race or language. The earlier meaning of the word was simply “the land of the Afghans”, a limited territory which did not include many parts of the present state but did comprise large districts now either independent or within the boundary of Pakistan. In the Middle Ages, up to the 18th century, the region was known as Khorāsān. Several important centers of Khorāsān are thus located in modern Afghanistan, such as Balkh, Herat, Ghazni and Kabul. Excavation of prehistoric sites suggests that humans were living in what is now Afghanistan at least 50,000 years ago, and that farming communities of the area were among the earliest in the world. Afghanistan is a country at a unique nexus point where numerous Eurasian civilizations have interacted and often fought, and was an important site of early historical activity. Through the ages, the Hindu Kush has been home to the Aryans ( Indo-Iranians: Indo-Aryans, Persians, Medes, Parthians, etc.). It also has been invaded by a host of people, including the Greeks, Mauryans, Kushans, Hepthalites, Arabs, Mongols, Turks, British, Soviets, and most recently by the Americans. On other occasions, native entities have invaded surrounding regions to form empires of their own. Between 2000 and 1200 BC, waves of Indo-European-speaking Aryans are thought to have flooded into this part of Asia which now consists of modern-day Afghanistan, Iran, Turkmenistan, Uzbekistan, Tajikistan, Pakistan and others, setting up a nation that during the rule of Medes and the Persian Empire became known as Aryānām Xšaθra or Airyānem Vāejah. Later, during the rule of Ashkanian, Sasanian and after, it was called Erānshahr ايرانشهر (Irānshæhr) meaning "Dominion of the Aryans", which included large parts of Mesopotamia, the Caucasus, Armenia, Azerbaijan, Iran and modern-day Central Asia (Afghanistan, Turkmenistan, Uzbekistan, Tajikistan, the western part of Pakistan, etc.). Buddhas of Bamyan were the largest Buddha statues in the world, dating back to 1st century A.D. It has been speculated that Zoroastrianism might have originated in what is now Afghanistan between 1800 to 800 BC. Ancient Eastern Iranian languages, such as Avestan, may have been spoken in this region around a similar time-line with the rise of Zoroastrianism. By the middle of the 6th century BC, the Persian Empire of the Achaemenids supplanted the Median Empire and incorporated what was known as Persia to Greeks within its boundaries; and by 330 BC, Alexander the Great had invaded Afghanistan and conquered the surrounding regions. Following Alexander's brief occupation, the Hellenistic successor states of the Seleucids and Greco-Bactrians controlled the area, while the Mauryas from India annexed the southeast for a time and introduced Buddhism to the region until the area returned to the Bactrian rule. During the 1st century AD, the Tocharian Kushans created a vast dynasty in Khorasan, bringing the Buddhism culture into this territory. Kushanians were then defeated by Sassanids in the 3rd century AD. Sassanids ruled up to the 7th century, when Muslim Arab armies conquered the Sassanid Empire in the Battle of al-Qādisiyyah. The Arab Empire initially annexed parts of western Afghanistan in 652 AD, then conquered north of Afghanistan by 809 AD and administered that region as Khorasan. Over time much of the local population converted to Islam. The region of modern Afghanistan became the centre of various important empires, including the Ghaznavid Empire (962-1151), founded by a local Afghan ruler from Ghazni named Mahmud Ghaznavi. This empire was replaced by the Ghorid Empire (1151-1219), founded by another local Afghan ruler, Muhammad Ghori, whose domains laid the foundations for the Delhi Sultanate in India. In 1219, the region was overrun by the Mongols under Genghis Khan, who devastated the land. Their rule continued with the Ilkhanates, and was extended further following the invasion of Timur Lang, a ruler from Central Asia. In 1504, Babur, a descendant of both Timur Lang and Genghis Khan, established the Mughal Empire with its capital at Kabul. By the early 1700s, the region of present-day Afghanistan was controlled by three ruling groups: Uzbeks to the north, Safavids to the west and the remaining larger area by the Mughals. In 1709, Mirwais Khan Hotak, a local Afghan (Pashtun) from the Ghilzai clan, overthrew and killed Gurgin Khan, the Safavid governor of Kandahar. Mirwais Khan successfully defeated the Persian Safavids, who were attempting to convert the local population of Kandahar from Sunni to Shia sect of Islam. Mirwais held the region of Kandahar until his death in 1715 and was succeeded by his son Mahmud Hotak. In 1722, Mahmud Hotak led an Afghan army to Isfahan, sacked the city and proclaimed himself Shah of Persia (meaning King of Persia). The Afghan dynasty was eventually removed from power by a new ruler, Nadir Shah of Persia. In 1738, Nadir Shah conquered Kandahar; in the same year he occupied Ghazni, Kabul and Lahore. On June 19, 1747, Nadir Shah was assassinated, possibly planned by his nephew Ali Qoli. In the same year, one of Nadir Shah's high-ranking military generals, Ahmad Shah Abdali, a Pashtun from the Abdali clan, called for a loya jirga following Nadir Shah's assassination. The Afghans came together at Kandahar and unanimously chose Ahmad Shah to be the King, who changed his last name to Durrani (meaning Pearl). By 1751, Ahmad Shah Durrani managed to conquer and rule the entire present-day Afghanistan, Pakistan, and Khorassan region of Iran, along with Delhi in India. In 1772, Ahmad Shah retired to his home in Maruf, Kandahar, where he died peacefully. He was succeeded by his son, Timur Shah Durrani, who transferred the capital from Kandahar to Kabul. Timur died in 1793 and was finally succeeded by his son Zaman Shah Durrani. During the 19th century, following the Anglo-Afghan wars (fought 1839-1842, 1878-1880, and lastly in 1919) and the ascension of the Barakzai Pashtun dynasty, Afghanistan saw much of its territory and autonomy ceded to the United Kingdom. The UK exercised a great deal of influence, and it was not until King Amanullah Khan acceded to the throne in 1919 (see " The Great Game") that Afghanistan regained complete independence. During the period of British intervention in Afghanistan, ethnic Pashtun territories were divided by the Durand Line, and this would lead to strained relations between Afghanistan and British India – and later the new state of Pakistan – over what came to be known as the Pashtunistan debate. The longest period of stability in Afghanistan was between 1933 and 1973, when the country was under the rule of King Zahir Shah. However, in 1973, Zahir's brother-in-law, Sardar Mohammed Daoud launched a bloodless coup. Daoud and his entire family were murdered in 1978 when the communist People's Democratic Party of Afghanistan launched a coup known as the Great Saur Revolution and took over the government. Opposition against, and conflict within, the series of communist governments that followed, was considerable. As part of a Cold War strategy, in 1979 the United States government under President Jimmy Carter and National Security Advisor Zbigniew Brzezinski began to covertly fund and train anti-government Mujahideen forces through the Pakistani secret service agency known as Inter Services Intelligence (ISI), who were derived from discontented Muslims in the country who opposed the official atheism of the Marxist regime. In order to bolster the local Communist forces, the Soviet Union—citing the 1978 Treaty of Friendship, Cooperation and Good Neighborliness that had been signed between the two countries —intervened on December 24, 1979. The Soviet occupation resulted in a mass exodus of over 5 million Afghans who moved into refugee camps in neighboring Pakistan and Iran. More than 3 million settled in Pakistan alone. Faced with mounting international pressure and the loss of approximately 15,000 Soviet soldiers as a result of Mujahideen opposition forces trained by the United States, Pakistan, and other foreign governments, the Soviets withdrew ten years later, in 1989. For more details, see Soviet war in Afghanistan. The Soviet withdrawal from the Democratic Republic of Afghanistan was seen as an ideological victory in the US, which had backed the Mujahideen through three US presidential administrations in order to counter Soviet influence in the vicinity of the oil-rich Persian Gulf. Following the removal of the Soviet forces in 1989, the US and its allies lost interest in Afghanistan and did little to help rebuild the war-ravaged country or influence events there. The USSR continued to support President Najibullah (formerly the head of the secret service, Khad) until his downfall in 1992. However, the absence of the Soviet forces resulted in the downfall of the pro-communist government as it steadily lost ground to the guerrilla forces. The result of the fighting was that the vast majority of the elites and intellectuals had escaped to take refuge abroad, a dangerous leadership vacuum thereby coming into existence. Fighting continued among the various Mujahideen factions, eventually giving rise to a state of warlordism. The most serious fighting during this growing civil conflict occurred in 1994, when 10,000 people were killed in Kabul. The chaos and corruption that dominated post-Soviet Afghanistan in turn spawned the rise of the Taliban, who were mostly Pashtuns from Kandahar. The Taliban developed as a politico-religious force, and eventually seized Kabul in 1996. By the end of 2000, the Taliban were able to capture 95% of the country, aside from the opposition ( Afghan Northern Alliance) strongholds primarily found in the northeast corner of Badakhshan Province. The Taliban sought to impose a strict interpretation of Islamic Sharia law and were later implicated as terrorists, most notably by harbouring and supporting Osama bin Laden's Al-Qaeda network. During the Taliban's seven-year rule, much of the population experienced restrictions on their freedom and violations of their human rights. Women were banned from jobs, girls forbidden to attend schools or universities. Those who resisted were punished. Communists were systematically eradicated and the strict Islamic Sharia law was imposed. The Taliban also managed to nearly eradicate the majority of the opium production by 2001. Following the September 11, 2001 attacks, the United States launched Operation Enduring Freedom, a military campaign to destroy the Al-Qaeda terrorist network operating in Afghanistan and overthrow their host (the Taliban). The US made common cause with the Afghan Northern Alliance to achieve its ends. In December 2001, major leaders from the Afghan opposition groups and diaspora met in Bonn, Germany, and agreed on a plan for the formulation of a new democratic government that resulted in the inauguration of Hamid Karzai, a Pashtun from Kandahar, as Chairman of the Afghan Interim Authority. After a nationwide Loya Jirga in 2002, Karzai was chosen by the representatives to assume the title as President of Afghanistan. In 2003, the country convened a Constitutional Loya Jirga (Council of Elders) and ratified a new constitution the following year. Hamid Karzai was elected President in a nation-wide election in October 2004. Legislative elections were held in September 2005. The National Assembly--the first freely elected legislature in Afghanistan since 1973--sat in December 2005, and was noteworthy for the inclusion of women as voters, candidates, and elected members. As the country continued to rebuild and recover, as of late 2006, it was still struggling against widespread poverty, continued warlordism, poor infrastructure, possibly the largest concentration of land mines and other unexploded ordinance on earth, as well as a huge illegal poppy and heroin trade. Afghanistan also remains subject to occasionally violent political jockeying. The landmine problem persists; in 2002, the Red Cross recorded 409 landmine deaths in Afghanistan, one of the highest mine tolls anywhere. The country continues to grapple with the Taliban insurgency, the threat of attacks from a few remaining al-Qaeda, and instability, particularly in the north, caused by the remaining semi-independent warlords. 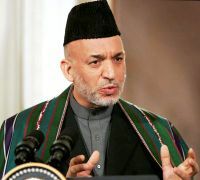 The current President of Afghanistan, Hamid Karzai. Politics in Afghanistan has historically consisted of power struggles, bloody coups and unstable transfers of power. With the exception of a military junta, the country has been governed by nearly every system of government over the past century, including a monarchy, republic, theocracy and communist state. The constitution ratified by the 2003 Loya jirga restructured the government as an Islamic republic consisting of three branches, ( executive, legislative, and judiciary). Afghanistan is currently led by President Hamid Karzai, who was elected in October 2004. While supporters have praised Karzai's efforts to promote national reconciliation and a growing economy, critics charge him with failing to rein in the country's warlords, inability to stem corruption and the growing drug trade, and the slow pace of reconstruction. The current parliament was elected in 2005. Among the elected officials were former mujahadeen, Taliban members, communists, reformists, and Islamic fundamentalists. 28% of the delegates elected were women, 3% more than the 25% minimum guaranteed under the constitution. This made Afghanistan, long known under the Taliban for its oppression of women, one of the leading countries in terms of female representation. 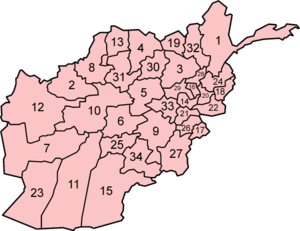 Afghanistan is administratively divided into thirty-four provinces (velayat), which are further subdivided into districts. Map showing the provinces of Afghanistan. Afghanistan is an extremely impoverished country, one of the world's poorest and least developed nations. Two-thirds of the population lives on less than US 2 dollars a day. The economy has suffered greatly from the recent political and military unrest since the 1979-80 Soviet invasion and subsequent conflicts, while severe drought added to the nation's difficulties in 1998-2001. 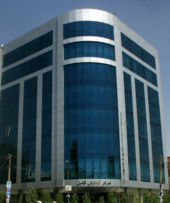 On a positive note, international efforts to rebuild Afghanistan led to the formation of the Afghan Interim Authority (AIA) as a result of the December 2001 Bonn Agreement, and later addressed at the Tokyo Donors Conference for Afghan Reconstruction in January 2002, where US 4.5 billion dollars were committed in a trust fund to be administered by the World Bank Group. Priority areas for reconstruction include the rebuilding of the educational system, health, and sanitation facilities, enhancement of administrative capacity, the development of the agricultural sector, and the rebuilding of road, energy, and telecommunication links. According to a 2004 report by the Asian Development Bank, the present reconstruction effort is two-pronged: first it focuses on rebuilding critical physical infrastructure, and second, on building modern public sector institutions from the remnants of Soviet style planning to ones that promote market-led development. But macroeconomic planning and management at present is hampered by poor information, weak service delivery systems, and less than adequate law enforcement. One of the main drivers for the current economic recovery is the return of over 4 million refugees from neighbouring countries and the West, who brought with them fresh energy, entrepreneurship and wealth-creating skills as well as much needed funds to start up businesses. What is also helping is the estimated US 2-3 billion dollars in international assistance every year, the partial recovery of the agricultural sector, and the reestablishment of market institutions. Private developments are also beginning to get underway. While the country's current account deficit is largely financed with the "donor money", only a small portion – about 15% – is provided directly to the government budget. The rest is provided to non-budgetary expenditure and donor-designated projects through the United Nations system and non-governmental organizations. The government had a central budget of only $350 million dollars in 2003 and an estimated $550 million in 2004. The country's foreign exchange reserves totals about $500 million. Revenue is mostly generated through customs, as income and corporate tax bases are negligible. The Afghan government and international donors seem to remain committed to improving access to basic necessities, infrastructure development, education, housing and economic reform. The central government is also focusing on improved revenue collection and public sector expenditure discipline. The rebuilding of the financial sector seems to have been so far successful. Money can now be transferred in and out of the country via official banking channels and according to accepted international norms. A new law on private investment provides three to seven-year tax holidays to eligible companies and a four-year exemption from exports tariffs and duties. While these improvements will help rebuild a strong basis for the nation in the future, for now, the majority of the population continues to suffer from insufficient food, clothing, housing, medical care, and other problems exacerbated by military operations and political uncertainties. The government is not strong enough to collect customs duties from all the provinces due to the power of the warlords. Fraud is widespread and "corruption is rife within all Afghan government organs, and central authority is barely felt in the lawless south and south-west". The real good news for Afghanistan is that it has great potentials to come out of poverty very quick and become a normal stable country. This is due to many reports showing that the country has possession of mass amounts of highly demanding natural resources and minerals. According to the US Geological Survey and the Afghan Ministry of Mines and Industry, Afghanistan may be possessing 15.6 trillion cubic feet of natural gas, 1.6 billion barrels of oil and up to 1,325 million barrels of natural gas liquids. This could mark the turning point in Afghanistan’s reconstruction efforts. Energy exports could generate the revenue that Afghan officials need to modernize the country’s infrastructure and expand economic opportunities for the beleaguered and fractious population. Other reports suggest that the country has huge amounts of gold, copper, coal, iron ore and other rich minerals. The CIA factbook on languages spoken in Afghanistan is as follows: Pashto 35% (in gray) and Persian ( Dari) 50% (in pink), both Indo-European languages from the Iranian languages sub-family. Others include Turkic languages (primarily Uzbek and Turkmen) 9% (in green), as well as 30 minor languages 4% (primarily Balochi (in orange) and Pashai (in blue) and Nuristasni (in purple). Bilingualism is common. According to the Encyclopædia Iranica, the Persian language is the mother tongue of roughly 1/3 of Afghanistan's population, while - at the same time - it is the most widely used language of the country, spoken by ca. 90% of the population. It further states that Pashto is spoken by ca. 50% of the population. Religiously, Afghans are over 99% Muslims: approximately 74-89% Sunni and 9-25% Shi'a (estimates vary). Afghanistan was once home to an ancient Jewish community, numbering approximately 5,000 in 1948 . (See Bukharan Jews.) Most Jewish families fled the country after the 1979 Soviet invasion, and only one individual, Zablon Simintov, remains today. With the fall of the Taliban, a number of Sikhs have returned to Kabul, Kandahar, Nangarhar and Ghazni provinces of Afghanistan. The only city in Afghanistan with over one million residents is its capital, Kabul. The other major cities in the country are, in order of population size, Kandahar, Herat, Mazari Sharif, Jalalabad, Ghazni and Kunduz. Afghans display pride in their religion, country, ancestry, and above all, their independence. Like other highlanders, Afghans are regarded with mingled apprehension and condescension, for their high regard for personal honour, for their clan loyalty and for their readiness to carry and use arms to settle disputes. As clan warfare / internecine feuding has been one of their chief occupations since time immemorial, this individualistic trait has made it difficult for foreign invaders to hold the region. Afghanistan has a complex history that has survived either in its current cultures or in the form of various languages and monuments. However, many of the country's historic monuments have been damaged in recent wars. 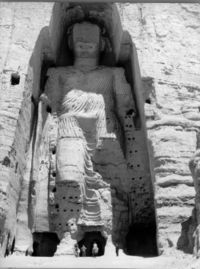 The two famous statues of Buddha in the Bamyan Province were destroyed by the Taliban, who regarded them as idolatrous. Other famous sites include the very cities of Kandahar, Herat, Ghazni and Balkh. The Minaret of Jam, in the Hari Rud valley, is a UNESCO World Heritage site. The cloak worn by Prophet Mohammad is stored inside the famouse Khalka Sharifa in Kandahar City. The people of Afghanistan are prominent horsemen as the national sport is Buzkashi, similar to Polo, but instead which a goat carcass is used instead of a ball. Afghan hounds (a type of running dog) also originated from Afghanistan. Although literacy levels are very low, classic Persian poetry plays a very important role in Afghan culture. Poetry has always been one of the major educational pillars in Iran and, consequently, Afghanistan, to the level that it has integrated itself into culture. Persian culture has, and continues to, exert a great influence over Afghan culture. Private poetry competition events known as “musha’era” are quite common even among ordinary people. Almost every home owns one or more poetry collection of some sort, even if it is not read often. The eastern dialects of the Persian language are popularly known as " Dari" outside of Iran. The name itself derives from "Pārsī-e Darbārī", meaning Persian of the royal courts. The ancient term Darī - one of the original names of the Persian language - was revived in the Afghan constitution of 1964, and was intended "to signify that Afghans consider their country the cradle of the language. Hence, the name Fārsī, the langue of Fārs, is strictly avoided." Many of the famous Iranian poets of 10th to 15th centuries stem from where is now known as Afghanistan. They were mostly also scholars in many disciplines like languages, natural sciences, medicine, religion and astronomy. Examples are Mowlānā Rumi, who was born and educated in Balkh in the 13th century and moved to Konya in modern-day Turkey, Sanaayi Ghaznavi (12th century, native of Ghazni provice), Jāmī of Herāt (15th century, native of Jam-e-Herat in western Afghanistan), Nizām ud-Dīn Alī Sher Navā'ī, (15th century, Herat province). Most of these individuals were of Persian ( Tājīk) ethnicity who still form the second-largest ethnic group in Afghanistan. Also, some of the contemporary Persian language poets and writers, who are relatively well-known in both Iran and Afghanistan include Ustad Betab, Khalilullah Khalili, Sufi Ghulam Nabi Ashqari,, Qahar Asey, Parwin Pazwak and others. In 2003, Khaled Hosseini published The Kiterunner which though fiction, captured much of the history, politics and culture experienced in Afghanistan from the 1930s to present day. In addition to poets and authors, numerous Iranian scientists have had their origins lie in where it's now called Afghanistan. Most notable was Avicenna (Abu Alī Hussein ibn Sīnā) whose father hailed from Balkh. Ibn Sīnā, who travelled to Isfahan later in life to establish a medical school there, is known by some scholars as "the father of modern medicine". George Sarton called ibn Sīnā "the most famous scientist of Islam and one of the most famous of all races, places, and times." His most famous works are The Book of Healing and The Canon of Medicine, also known as the Qanun. Ibn Sīnā's story even found way to the contemporary English literature through Noah Gordon's The Physician, now published in many languages. Heathcote considers the tribal system to be the best way of organizing large groups of people in a country that is geographically difficult, and in a society that has an uncomplicated lifestyle - from a materialistic point of view. In the spring of 2003, it was estimated that 30% of Afghanistan's 7,000 schools had been very seriously damaged during more than two decades of civil war. Only half of the schools were reported to have clean water, while fewer than an estimated 40% had adequate sanitation. Education for boys was not a priority during the Taliban regime, and girls were banished from schools outright. As regards the poverty and violence of their surroundings, a study in 2002 by the Save the Children Fund said Afghan children were resilient and courageous. The study credited the strong institutions of family and community. Up to four million Afghan children, possibly the largest number ever, are believed to have enrolled for class for the school year beginning in March of 2003. Education is available for both girls and boys. Literacy of the entire population is estimated at 36%, the male literacy rate is 51% and female literacy is 21%. Another aspect of education that is rapidly changing in Afghanistan is the face of higher education. Following the fall of the Taliban, Kabul University was reopened to both male and female students. In 2006, the American University of Afghanistan will open its doors, with support from USAID and other donors. With the aim of providing a world-class, English-language, co-educational learning environment in Afghanistan, the university will take students from Afghanistan and the region. Afghanistan has rapidly increased in communications technology, and has embarked on wireless companies, television channels, and commercial international airlines. Afghan telecommunications companies, Afghan Wireless and Roshan, have boasted increase in rapid cellular phone usage. Afghanistan's commercial airlines, Ariana Afghan Airlines, now serves flights to London Heathrow, Frankfurt, Madrid, Rome, Dubai and Istanbul to and from Kabul and Herat. Afghanistan has also improved in vehicle conditions with Toyota, Land Rover, BMW and Hyundai dealerships all over Kabul, and a huge import of fine second-hand vehicles from UAE on display in Kandahar. Afghanistan, however, still is a long way from major modern technological advancements, but is on the fast road to that goal.